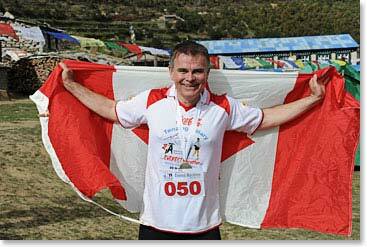 Yesterday, Canadian Leo Power crossed the finish line of the Tenzing–Hillary Everest Marathon. Despite the thin air, rough terrain, changing temperatures and steep trails, Leo completed the high altitude race in 8 hours 23 minutes, 29 seconds. Congratulations to Leo! And Leo wasn’t the only successful Berg Adventures runner: Crossing the finish line with him was Berg Adventures talented cook, Jheta Rai.